Open-source Operating System for the Bodymind. ∞OS /#eightos/ is open-source software for individuals and organizations. At its core is a set of principles — adaptivity, ∞-variability, resilience, modularity — that we experiment with and implement into our everyday behavior through physical practice on the level of the body. We combine complex system science, technology, dance, Systema martial art, and artistic practices to cultivate a new kind of aesth/et(h)ics based on ecological interaction, confluence and evolutionary creative flow. Using the agile approach we develop the education technology based on embodied understanding, bringing the body back into the equation in this digital age. We explore the behavioral and organizational patterns that emerge as a result of this practice and how it can be implemented in other contexts outside of the purely physical domain. We also study and document the effects and the implications of this approach as part of our ongoing research both in the scientific and in the artistic realms. The best way to experience ∞OS is to join one of our activation programs, which are hosted several times a year in different locations around the world. These programs include physical body and movement practice, organizational behavior seminars, and creative work with various digital tools, sound and visualization (see examples). Request an invitation to join a research lab session of ∞OS (usually 2 hours long) and experience a certain aspect of the practice. This event usually takes the shape of a workshop where we mix both theory and practice / physical movement. We host multiple events throughout the year around the world, so you can get as many passes as the number of events you want to join. If Level 1 is a demo version of ∞OS software then Level 2 is a full activation license. It is usually a 2-day long (x4 hours) session combining physical body practice, research, and creative work. You also get access to special training materials, digital and artistic software and hardware tools we created to facilitate ∞OS practice in other contexts. You will have a chance to learn and enhance your embodied understanding of ∞OS approach and integrate it into your daily practice. You can join one of the four sessions that we host every year. The number of places is limited, so it’s better to get your pass early. Your ticket is refundable and transferable, so you can return it or give it to somebody else. This is the best choice for organizations, producers and curators who want to create a custom-made ∞OS experience for a specific context. It can be a presentation, a performance, a workshop, a participatory experience or any other event. You can see reports from our previous events or check the examples of the modules that we can provide. Send us a message to receive more information. You can also join custom sessions as a participant, in which case we advise you to apply for the Level 1 or Level 2 as you will then be informed about the external events. Metaphor is a powerful tool that helps us understand things better. The core of ∞OS approach to learning is to offer a direct experience of a metaphor on the physical level. This provides a much more efficient pathway for information and ensures that it is incorporated on the level of reflexes, using the most efficient neural network there is: our bodymind. We also make use of dynamical systems theory and network science, as well as the various techniques and tools from agile development to create an adaptive, iterative, robust, sustainable and creative approach to learning. 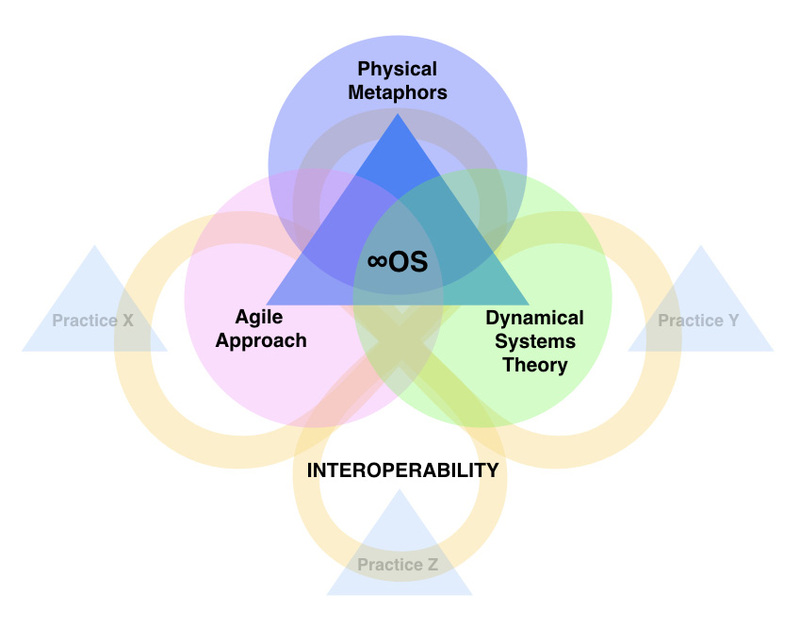 To make sure that our approach has practical implications we ensure that ∞OS is interoperable: applicable in any context, beyond the realm of the physical, as well as able to function together with other practices. ∞OS is a portable practice, you can apply it in any context: from fitness and self-defense, to intersubjective relations, business, and politics. Our set of principles helps you see tensions as opportunities and our procedures offer concrete formulas you can apply to reach your objectives. Choose the procedure below to see how ∞OS can be useful for you, depending on the situation you’re in. Software for the Bodymind Hardware.